A mind research experiment studying human consciousness goes horrifyingly wrong. Thousands are killed when a Russian suburb mysteriously disintegrates, leaving a mile-deep crater in which time and space are distorted. At the same time, a U.S. space shuttle vaporizes in orbit, and a Canadian mountaintop is ripped away. 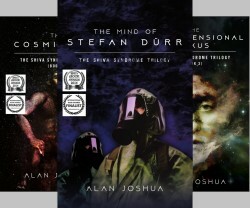 One thing lies behind the mystery: The enigmatic mind of Stefan Dürr. Existence is dreary hell for Dr. Beau Walker, an African-American/Mohawk researcher. An embittered loner, he sleepwalks through life until the government virtually kidnaps him to investigate the vanished city, hurling him into an incredibly menacing adventure beyond your wildest imaginings. Forced to join a U.S./Russian scientific team, Beau searches for the cause of the disasters. Beginning with a treacherous, life-threatening exploration of the anomalous crater, where scientific laws don’t apply, he’s thrown into a world of unimaginably advanced biotechnology, biowarfare, genetics, paranormal research, and military intrigue. The stakes are inconceivably high: Find and control the cause…or face worldwide obliteration as other minds across the globe tear reality apart. The first book of three based on paranormal research, SHIVA is an odyssey from science to neuroscience to the paranormal. Can you handle this mind-bending trip?